I wrote a blog article about fundamentals of grinding stones and sharpening before, but if you become interested in sharpening more, I guess you would like to know the details of whetstones more and more. This time, let me introduce the details of whetstones. I explained before that whetstones are briefly categorized into 3: coarse-grit grind stones, medium-grit grind stones and fine-grit grind stones, but today I will explain about 3 factors that determine the quality of whetstones. 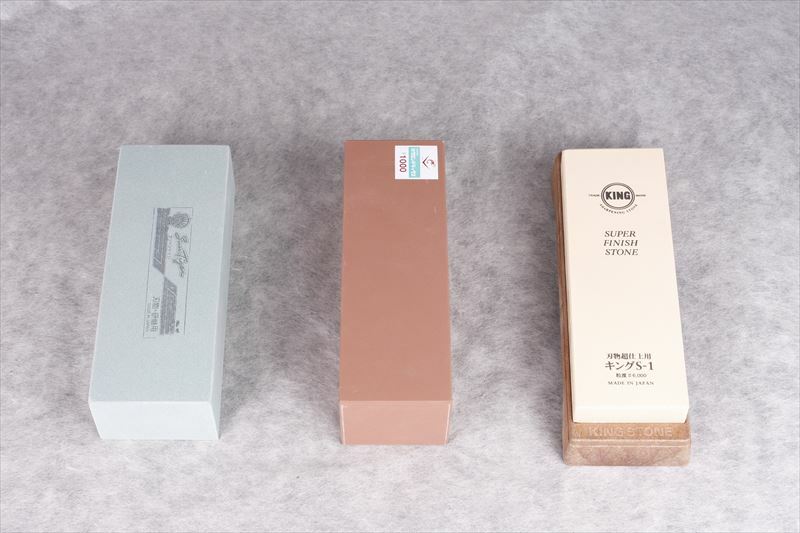 The quality of whetstones is said to be based on 3 factors as below. The role of abrasive grains is to sharpen a knife when they hit it. When abrasive grains hit a knife, they are worn out as well. Abrasive grains are briefly divided into 2 categories: the category of alumina and that of silicon carbide. The big factors that determine the quality of abrasive grains are hardness and abrasion resistance. The abrasive grains of silicon carbide are very hard while those of alumina are difficult to be worn out. Briefly speaking, the purity of GC is higher than that of C. Since GC is hard, it is mainly used for coarse-grit grind stones. On the other hand, WA is used for medium-grit grind stones and fine-grit grind stones in most cases. Since WA is hard to be worn out, it is good for stainless knives. It is often said that a type of abrasive grains can be distinguished with their colors, but grinding stones are usually colored, so it is difficult to tell a type of whetstones with their colors. Since WA and GC are expensive (generally, WA is more expensive than GC), A and C are often contained in some whetstones. The main manufacturing processes of whetstones are those of vitrified, resinoid and magnesia. Since the name of a manufacturing process includes the name of bond, some people say that the second factor of whetstones’ quality is bond. Briefly speaking, vitrified whetstones are made by burning. Since the power of keeping abrasive grains one another of vitrified whetstones is strong, their polishing force is strong. This manufacturing process is mainly used for coarse-grit grind stones, medium-grit grind stones. Since the vitrified whetstones are hard, their characteristic is that their shapes do not change very much, but since they are hard, their elastic forces are low. When abrasive grains are GC, this process is often used. This process has become a main stream recently. Since resinoid whetstones are made by aging at a low temperature, their elastic forces are high. We don’t need to soak them into water before using them, so we can start to sharpen knives with them smoothly. Magnesia whetstones are dried to solidify. Their characteristic is that their polishing force is relatively high and the whetstones are relatively soft. We can use them without soaking them in water, but the magnesia whetstones are dissolve in water if we soak them in water for a while. Some ceramic whetstones that are popular nowadays are made by this process. The final factor that determines the quality of whetstones is pores. Abrasive grains sharpen knives, but after they sharpen knives, they don’t function. As a result, they become waste and drop into pores. Therefore, if there are some pores to some extent, whetstones are not clogged. I have introduced the 3 factors that determines whetstones’ quality. If you would like to know more details, you may want to go to the websites of whetstones’ makers. I will write a blog article next time about 5 factors that determine whetstones’ quality.